The National Platform Future of Mobility (NPM) is the focal point for discussions on strategic decisions in the field of mobility. Changes in the mobility sector are accompanied by far-reaching technical, legal and social changes. For this reason, the NPM clarifies facts on complex topics and brings together relevant stakeholders, technical expertise and politics. Based on the results from discussion in the NPM, recommendations for action are made to politicians, businesses and society. In a total of six working groups, experts from a wide range of disciplines address key developments in the transport sector. This includes the requirements for achieving the energy and climate goals of the Germany Federal Government, the potential and challenges in the field of electromobility and alternative drive technologies and fuels, the digitalisation of the transport sector, securing Germany as a place for mobility and production, linking the transport sector with the energy system and standardising technological components in the transport sector. The working groups discuss possible technology-neutral options for action and formulate recommendations for action to the German Federal Government. The actors involved in the platform work independently and free of charge. The management and moderation of the platform are non-partisan and neutral. The topics of the platform include developing sets of measures with reliable timelines. 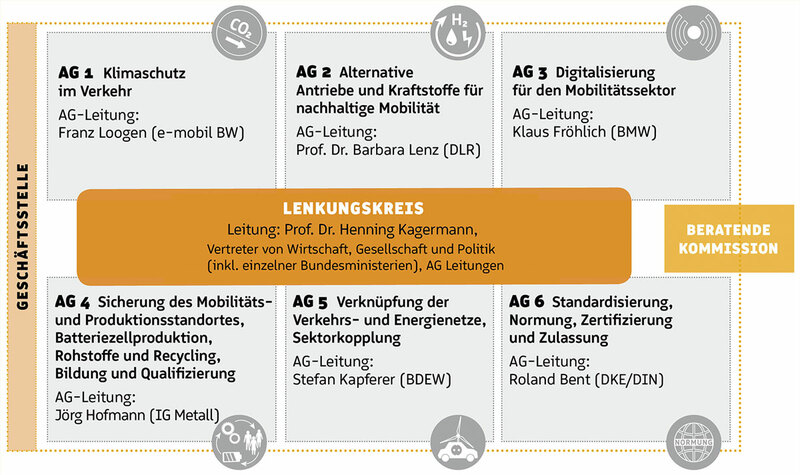 The aim is to recommend sets of measures that could together result in a work programme for the German Federal Government to shape a future-oriented, sustainable mobility system. The transport system should enable efficient, high-quality, flexible, available, safe, resilient and affordable mobility in both passenger and freight transport. The social, economic and technological drivers are always considered together as important processes of change for future mobility. The NPM accompanies the pursuit of the set goals as well as the implementation of concrete measures continuously and reports independently and neutrally on the progress achieved. The formation of the National Platform Future of Mobility (NPM) is based on the coalition agreement of CDU, CSU and SPD for the 19th legislative period. On September 19th, 2018, the Federal Transport Minister Andreas Scheuer introduced the convening of this platform to the Federal Cabinet and decided there. The NPM started its work with the constituent steering committee meeting on September 26th, 2018. The Steering Committee, alongside the working groups, provides the technical and content direction of the platform. The Steering Committee identifies new topics to be addressed in the platform and makes suggestions for their implementation. It also manages the content work of the working groups, monitors their implementation and advises on results. The recommendations for action from the NPM are made by the Steering Committee. The Steering Committee meets twice a year and as required. Prof. Dr. Henning Kagermann has assumed the role of chairman of the steering committee. Other members of the steering committee can be found in the following overview. The Advisory Commission is the interface between the NPM and the Federal Parliament. It informs the Parliament about the results of the platform and receives comments from the Parliament. The Advisory Commission communicates its assessment to the Steering Committee. The platform’s content work takes place within the Working Groups. The Working Groups take up current and relevant trends and questions within their subject area, clarify facts on particularly complex aspects and develop concrete recommendations for action and packages of measures to shape the respective subject area. The results of the Working Groups are presented to the Steering Committee by the Heads of the Working Groups and discussed there together with the results of the other Working Groups. The NPM Secretariat organises and coordinates the Platform’s activities. It informs on the progress of cooperation and is the central contact for the private sector, public sector, civil society and media. The office is headed by the Federal Ministry of Transport and Digital Infrastructure. The implementation is managed by IFOK GmbH (the Project Office) and acatech (the Chairman’s Office). The Project Office assumes the role of neutral platform management and coordinates the processes of the working group. It supports the heads of the working group as well as the responsible divisions from the BMVI (German Federal Ministry for Transportation and Digital Infrastructure), BMWi (German Federal Ministry for Economic Affairs and Energy) and BMU (German Federal Ministry for the Environment, Nature Protection and Nuclear Safety) in the operational preparation, implementation and documentation of the meetings of the Steering Committee and Working Groups. In addition, it coordinates enquiries from the press to the Platform. The Chairman’s Office is responsible for the consolidation and preparation of the working group results and advises the heads of the working groups as well as the responsible divisions of the BMVI, BMWi and BMU on the content.